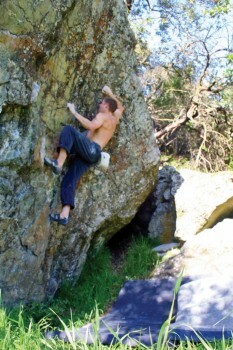 In the rolling hills between I-280 and US-101 near Redwood City are the Farm Hill Boulders and Handley Rock. The main highball face of the Farm Hill Boulder can be seen right off the road and has a couple good arêtes, a fun face and a short, tough traverse. On the hill behind the main face are a couple smaller boulders with a good V0 and a daring V1 over a nasty old mattress. Nearby Handley Rock park is a nice place to check out views of the Bay and do some fun sandstone scrambling, toproping and bouldering. Farm Hill Arête V2, Farm Hill Face V3, Farm Hill Traverse V4, Right Arête V1. Which SuperTopo guidebooks cover Farm Hill? Plummet on Farm Hill Traverse (V4).